In this scene from Reservoir Dogs the song playing on the radio “Stuck In The Middle With You? is contrapuntal to the action, revealing the psychopathic nature of Mr Blonde. Parallel sound would have created a completely different sense, such as in the second clip: Casino Royale. This second clip uses no music, instead opts for atmospheric diegetic sound effects which create a much tenser atmosphere. 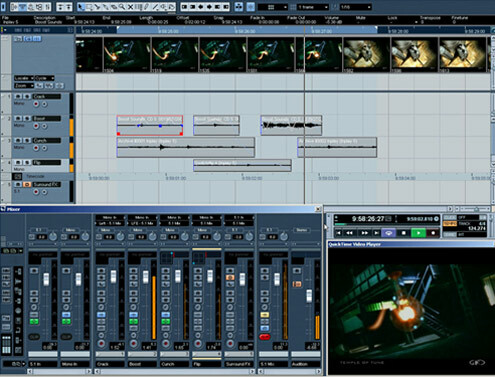 Students often decide to create heavy dialogue pieces, or select one or two pieces of music which provide an entire soundtrack for their film pieces. Both these methods should be avoided. The first encourages students to ignore the aural environment (or what sound designers call the soundscape) and instead focus entirely on dialogue. Students often use their friends (who are not professional actors, nor do they have experience themselves in directing actors) and often have not had the time (due to the nature of the course) to develop tight, professional dialogue (this can take years of training). Therefore dialogue in student films often feels static and forced; it can take the audiences’ attention away from their other cinematic skills and should, at this level, be avoided. The second of these methods increases the danger of the student editing their film to the music in such a way that it almost becomes a narrative music video.